CANTON, MA (February 13, 2014) -- Dunkin’ Donuts, America’s favorite all-day, everyday stop for coffee and baked goods, is celebrating Valentine’s Day and the brand’s newest seasonal treats – a Brown Sugar Cinnamon Latte and two varieties of heart-shaped donuts -- with two special promotions to help make the holiday a little sweeter. Today and tomorrow, February 13 and 14, up to a total of 1,000 people could win a $5 Dunkin’ Donuts mGift when they register with Zoosk, a leading online dating company and the #1 dating App in the iTunes Store. Dunkin’ Donuts is also launching a Twitter sweepstakes, asking people to tweet a message for their Valentine for the chance to win mGifts, and to possibly have their message turned into a personalized Valentine’s Day video. In honor of Dunkin’ Donuts’ sweet pairing of Brown Sugar and Cinnamon in the brand’s new Brown Sugar Cinnamon Latte, Zoosk, in partnership with Dunkin’ Donuts, is offering a sweet deal for anyone seeking their own perfect pairing. Today and tomorrow, people who register at Zoosk will have the chance to win a $5 Dunkin’ Donuts mGift, perfect for any coffee date. To be eligible, people must register through this special link, bit.ly/coffeedates, and Zoosk will randomly select up to a total of 1,000 winners to receive the Dunkin’ Donuts mGift. No purchase necessary, must be 18+ to enter. Void where prohibited. Please visit bit.ly/zooskterms for more information. Also, on Valentine’s Day, Dunkin’ Donuts is conducting a “heartfelt” Twitter sweepstakes to celebrate the return of the brand’s heart-shaped donuts. From 8 a.m. to 12 p.m. EST, Dunkin’ Donuts is asking fans to tweet a special message for their own sweetheart, using the hashtag #DDHearts. Fourteen participants will be selected to win a $20 mGift, while others may be selected for a special prize to help them show some heart: a $100 mGift and a special video to send to their Valentine. Each video will be posted to YouTube and tweeted back to the fan who entered, and will feature their own tweeted message and a heart-shaped donut personalized with the name of their sweetheart. The donut will be personally created and decorated by Rick Golden, Dunkin’ Donuts’ Manager of Donut Excellence. No purchase necessary, must be 18+ to enter. Void where prohibited. For additional terms and conditions related to Dunkin’ Donuts’ DDHearts sweepstakes, please visit: http://www.dunkindonuts.com/content/dunkindonuts/en/promotions/HaveaHeartwithDunkinDonutsSweepstakes.html. 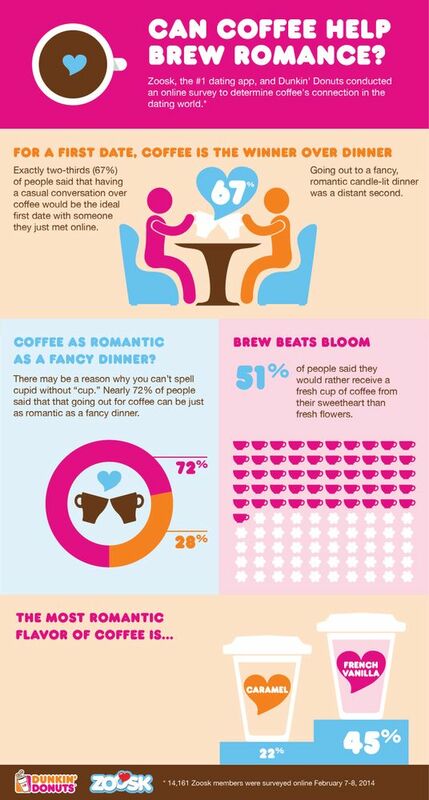 For an ideal first date, coffee is the winner over dinner: Exactly two-thirds (67%) of people said that having a casual conversation over coffee would be the ideal first date with someone they just met online. Going out to a fancy, romantic candle-lit dinner was a distant second at 24%. Coffee as romantic as a fancy dinner? There may be a reason why you can’t spell cupid without “cup:” Nearly 72% of people said that that going out for coffee can be just as romantic as a fancy dinner. Brew beats bloom: More than half of people (51%) said they would rather receive a fresh cup of coffee from their sweetheart than fresh flowers. What is the most romantic flavor of coffee? French Vanilla was number one, followed by Caramel. This Valentine’s Day season, Dunkin’ Donuts is spreading the love with two varieties of heart-shaped donuts, introducing the new Cookie Dough Donut, featuring cookie-dough flavored buttercream filling, topped with chocolate icing and chocolate chips, and bringing back the Brownie Batter Donut, filled with chocolaty brownie batter flavored buttercream filling and topped with chocolate icing and heart sprinkles. For a perfect Valentine’s Day beverage for coffee lovers, Dunkin’ Donuts’ Brown Sugar Cinnamon Latte and Coffee, available hot or iced, serves up some sugar and spice with a combination of classic kitchen flavors to create a warm, indulgent taste. All menu items are available at participating Dunkin’ Donuts restaurants nationwide through February. Zoosk is a leading online dating company that learns as you click in order to pair you with singles with whom you’re likely to discover mutual attraction. Zoosk’s Behavioral Matchmaking™ technology is constantly learning from the actions of over 25 million members in order to deliver better matches in real time. With the #1 grossing dating app in the iTunes Store, Zoosk is a market leader in mobile dating. Available in over 80 countries and translated into 25 languages, Zoosk is a truly global online dating platform.